...... baby showers, bridal showers, educational bingo (math, expanding vocabulary and ESL). Features also include custom imaging for both background and bingo space item with an easy to use image cropping tool. 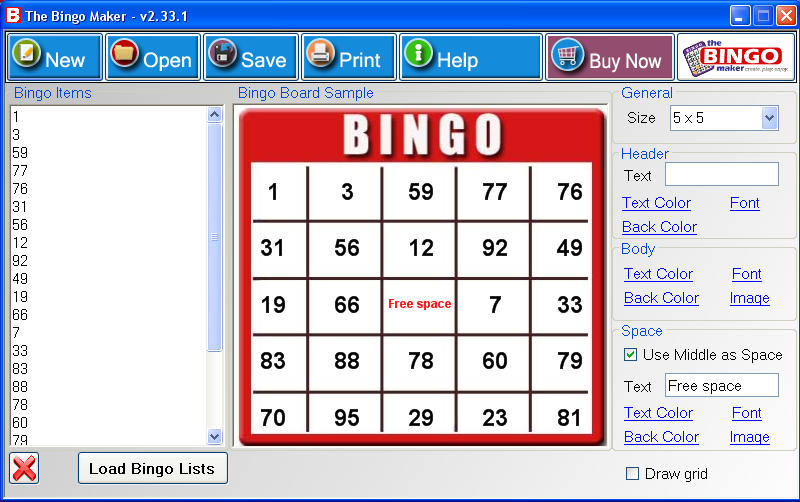 Print or export (PDF format) your bingo game in minutes including ready to cut bingo call list. Qweas is providing links to The Bingo Maker 4.0 as a courtesy, and makes no representations regarding The Bingo Maker or any other applications or any information related thereto. Any questions, complaints or claims regarding this application The Bingo Maker 4.0 must be directed to the appropriate software vendor. You may click the publisher link of The Bingo Maker on the top of this page to get more details about the vendor.